Bloggamooga: So long, Mansfield Press. It's been surreal. This past fall, I said goodbye to my partnership with Mansfield Press, where I had been acquiring and editing books of Canadian poetry, fiction and non-fiction for a decade. As an experiment, Mansfield founder/publisher/editor Denis De Klerck brought me aboard to broaden his list with a single book in 2007. When we couldn't decide between the two I proposed, we went with both, titles by Steve Venright and Lillian Necakov. Each season after that, I brought on between one and six books. Working on the 46 books, by 30 different authors, was one of the most exciting and fulfilling facets of my literary life so far. It was a thrill to help an author's first book into the world, or to work with a seasoned pro I'd admired since I was a kid, and equally to see an already-published author move into the mid-career range with second, third, fourth books. I'd like to think that with my contribution to the press Denis launched with four poetry titles in 2000, Mansfield's audience expanded, just as did its aesthetic. 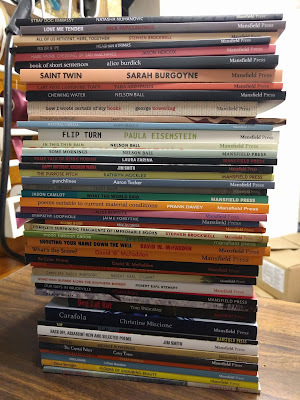 Under my "a stuart ross book" imprint, I was responsible for bringing out stunning first full-length books by Natasha Nuhanovic, Nick Papaxanthos, Sarah Burgoyne, Tara Azzopardi, Paula Eisenstein, Aaron Tucker, Leigh Nash, Jaime Forsythe, Robert Earl Stewart, Carey Toane, and Peter Norman. In the cases of Robert and Peter, I also helped their second collections into the world. I also co-translated and saw through the press the first English-language book by francophone Montreal poet Marie-Ève Comtois, which was an amazing experience. In the mid-career category, I ushered in new books by Dani Couture, Meaghan Strimas, Stephen Brockwell (two collections), Jason Heroux (three collections), Laura Farina, Jason Camlot, Alice Burdick (three collections), Lillian Necakov (two collections), Kathryn Mockler, Christine Miscione (her first novel), Steve Venright, and Gary Barwin. As for the old-timers, I had the privilege of working with these guys, all of whom I'd been following for decades: David McFadden (five books, including one memoir), George Bowering (a poetry collection and an essay collection), Nelson Ball (three collections), Frank Davey, Tom Walmsley (a novel), and Jim Smith (two collections, including a New & Selected). I also did another really unusual book: a collection of collaborations between me and 29 other Canadian poets. The one book I see I neglected to add to the stack in that photo above is David W. McFadden's 2015 collection, Abnormal Brain Sonnets. It's been a fulfilling journey with Dave: I've loved his work since I was a teenager, and he was a big influence on my own writing. Around 2004, Paul Vermeersch asked me to edit a Selected by McFadden for Paul's then-imprint with Insomniac Press. An incredible, exhilarating experience, and one followed up by a Collected Long Poems. Dave and I had a lot of success with his books: one was short-listed for the Governor General's Award for Poetry, and two for the Canadian Griffin Poetry Prize — with the second, What's the Score?, winning that most prestigious award. A nice recognition of Dave's remarkable six-decade writing career. All these books are out there in the world, and you can still explore them. Find them in your local library, order them from Mansfield, or order them through your local indie bookstore or big-boxer. You might even find copies of some of the more recent titles on bookstore shelves. I know I'm not exactly objective, but I believe many of these books are among the most exciting and unusual that contemporary Canadian poetry has produced. I wish I'd written most of them myself! There were more books I had hoped to bring through the press, too, but I had to accept it was time to move on. Some of these books received a lot of attention, but many that were more than worthy never even got a singe print review. That's the struggle, increasingly, that Canadian publishers face. That, and finding space on bookstore shelves. Well, Canadian publishers face a lot more challenges than even those. Although not all the books I championed through my imprint were surreal or post-surreal, "a stuart ross book" still feels to me a bit like a continuation of my 2005 anthology, Surreal Estate: 13 Canadian Poets Under the Influence (The Mercury Press). And while I'm proud of what I accomplished at Mansfield, my imprint isn't without its shortcomings. I need to think more about those, and I'll try to talk about them in a future blog. Meanwhile, my gratitude to Denis for the opportunity to make what I feel is a significant contribution to the dialogue that is Canadian poetry. Other projects are afoot, and more about those later.